411 Freebies And More: Select NCAA Hoodies for $10! Select NCAA Hoodies for $10! 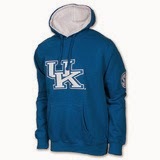 Select NCAA Hoodie Sweatshirts, once $40, are now $9.99 at Finish Line. Economy shipping starts at $5.49. This is the best price we could find on similar hoodies by at least $8, and one of the lowest prices we've ever seen on these popular sweatshirts. They are offered in men's, women's, and kids sizes, and in various schools. The pictured Kentucky Wildcats Men's Alternate Icon Hoodie, for example, drops to $9.99 as well, and is offered in S to XXL. Note: some styles have only a size or two still available, and not all schools are represented, but at $10, it's still worth a look to see if you can score one. Sales tax is charged in most states.